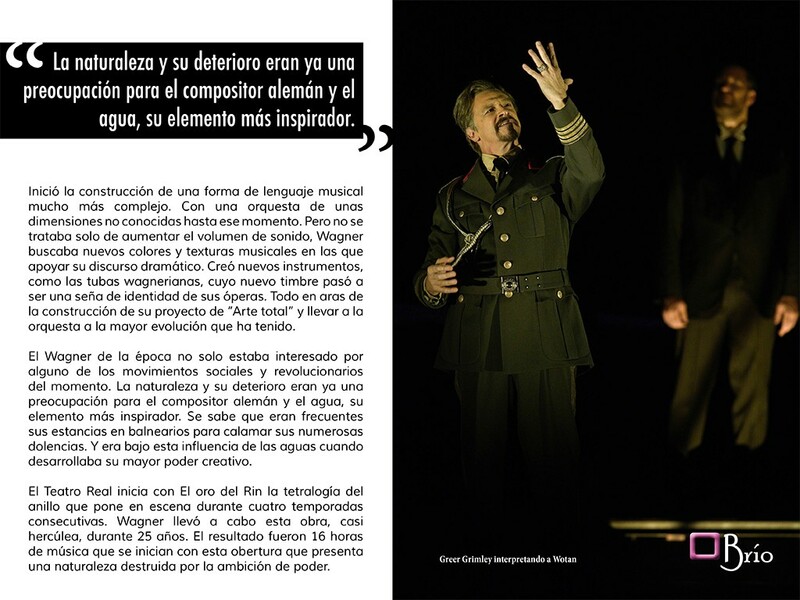 Titular Orchestra of the Teatro RealWagner had failed as a political revolutionary, but he was willing to be more successful revolutionizing the arts ". 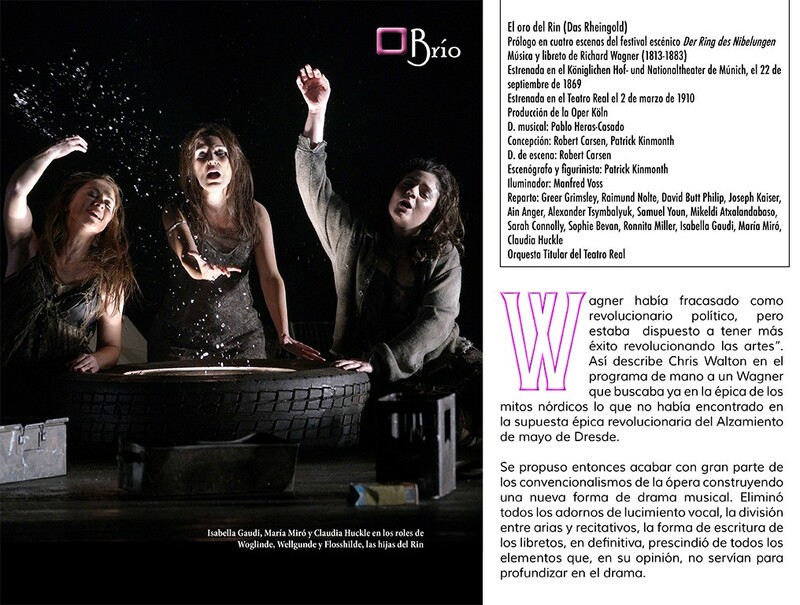 Chris Walton describes in the playbill seeking a Wagner already in the epic Norse myths which were not found in the supposed revolutionary epic Uprising May Dresde.Se then proposed to end much of the conventions of opera building a new form of musical drama. He eliminated all the trimmings vocal lucimiento, the division between arias and recitatives, how to write scripts, definitely, He dispensed with all the elements, in your opinion, not served to deepen the drama. He began construction of a form of musical language much more complex. With an orchestra of dimensions hitherto unknown. But it was not only to increase the volume of sound, Wagner was looking for new colors and musical textures in which support his dramatic speech. He created new instruments, as snorkels Wagnerist, whose new timbre became a hallmark of his operas. All for the sake of building their project "total art" and the orchestra lead to more developments that have taken. The Wagner of the time was not only interested in some of the social and revolutionary movements of the time. Nature and deterioration were already a concern for the German composer and water, its most inspiring element. It was known to frequent his visits to spas to soothe their numerous ailments. And it was under this influence of water when developing his greatest creative power. 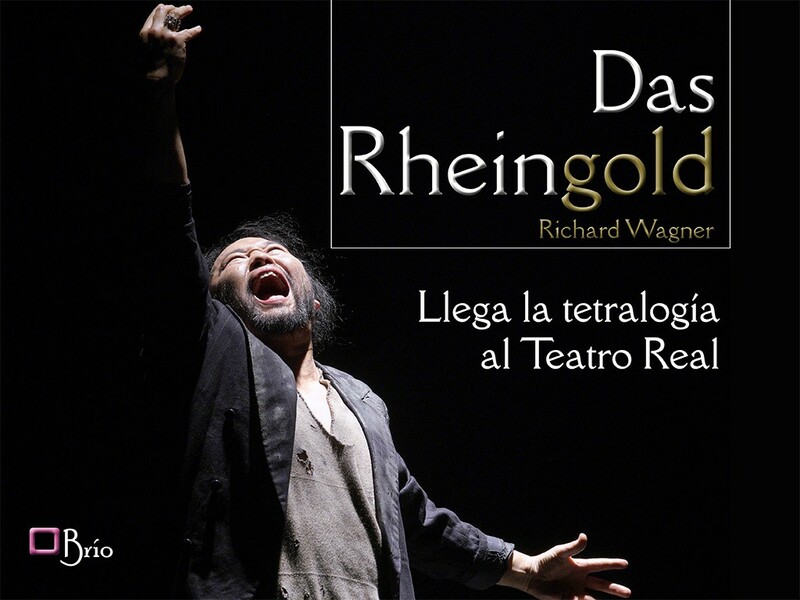 The Royal Theater begins with Das Rheingold tetralogy the ring staged for four consecutive seasons. 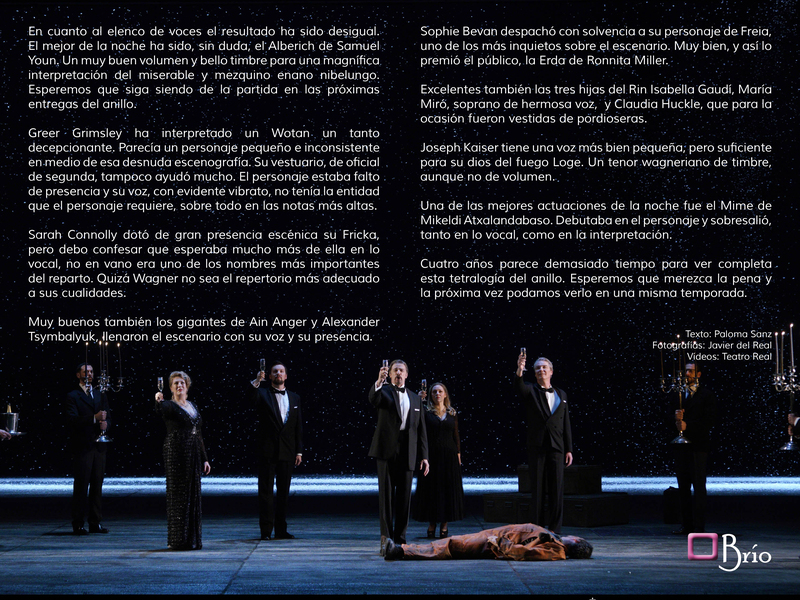 Wagner conducted this work, casi herculean, during 25 years. The results were 16 hours of music that start with this overture presents a destroyed by the lust for power nature. 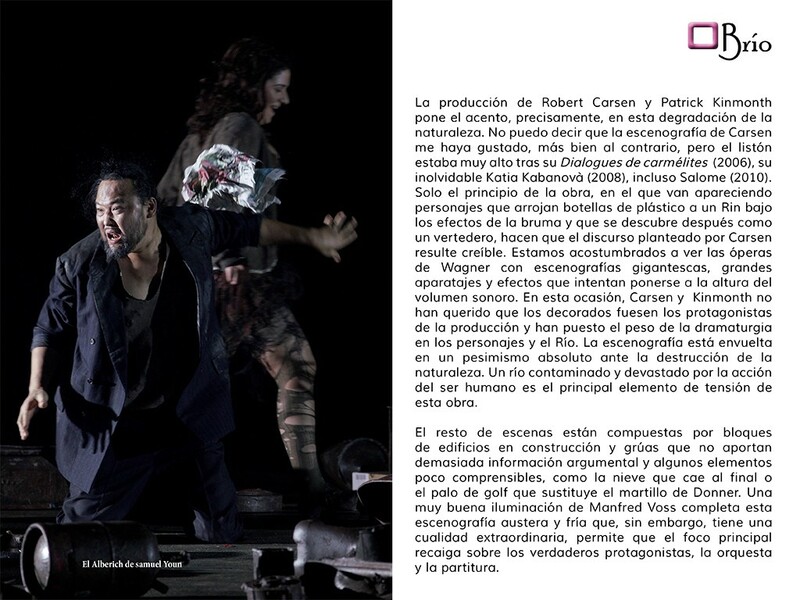 Robert Carsen production and emphasizes Patrick Kinmonth, precisely, this nature degradation. I can not say that the scenery of Carsen liked me, quite the contrary, but the bar was very high after his Dialogues of Carmelites (2006), Katia Kabanova his unforgettable (2008), even Salome (2010). Only the beginning of the work, in which they appear characters who throw plastic bottles to Rin under the effects of the haze and then discover that as a dumping ground, They make the speech posed by Carsen credible. 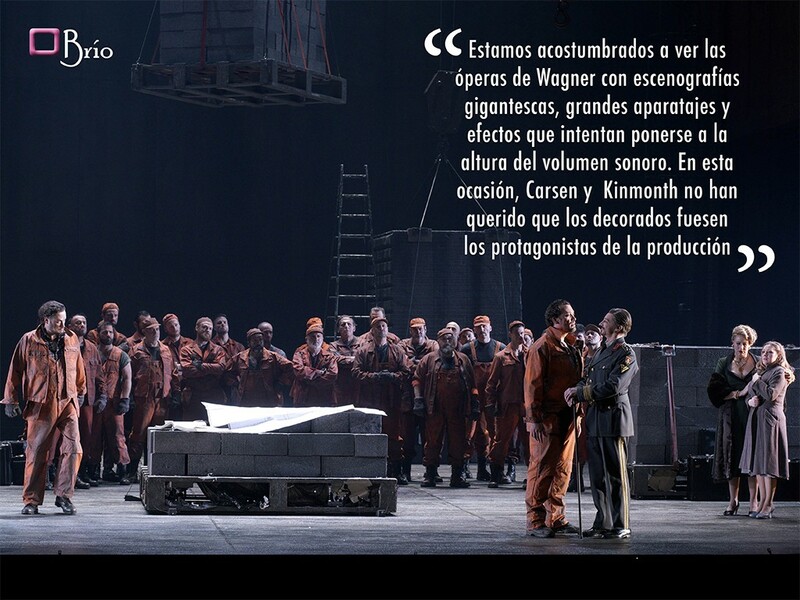 We are used to seeing Wagner's operas with gigantic scenography, large aparatajes and effects that try to catch up loudness. This time, Carsen and Kinmonth did not want the sets were the protagonists of production and have put the weight of the drama in the characters and the River. The scenery is embroiled in an absolute pessimism about the destruction of nature. A river polluted and devastated by human action is the main element of this work stress. The other scenes are composed of blocks of buildings under construction and cranes that do not add too much plot information and some little comprehensible elements, Snow that falls at the end or the golf club replaces the hammer Donner. A very good lighting Manfred Voss complete this austere and cold scenography, but nevertheless, It has an extraordinary quality, It allows the main focus falls on the protagonists, the orchestra and the score. 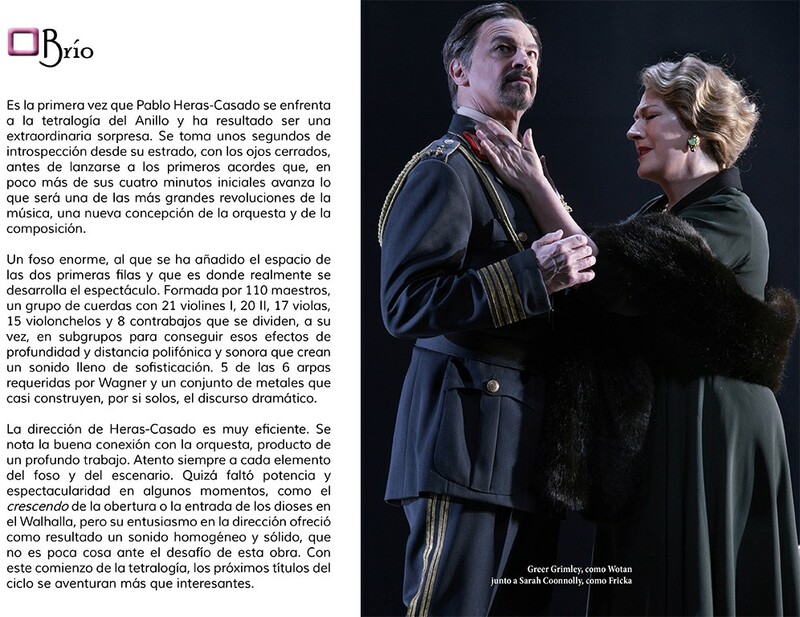 It is the first time that Pablo Heras-Casado faces of the Ring tetralogy and has proven to be an extraordinary surprise. It takes a few seconds of introspection from the bench, with eyes closed, before launching into the first chords, in just over four minutes initial advance what will be one of the greatest revolutions of music, a new conception of the orchestra and composition. A huge pit, to which it has been added space of the first two rows and that's where the show is really. Formed by 110 teachers, a group of strings 21 I violins, 20 II, 17 violas, 15 cellos and 8 contrabasses dividing, at the same time, into subgroups to achieve these effects of distance and depth and polyphonic sound that create a sound full of sophistication. 5 of the 6 harps required by Wagner and a set of metals almost construct, by themselves, the dramatic speech. The address Heras-Casado is very efficient. Good connection with the orchestra note, product of a deep work. Always attentive to every element of the pit and the stage. Perhaps lacked power and showmanship at times, as the crescendo of the overture or the entry of the gods in Walhalla, but their enthusiasm in the direction offered results in a homogeneous solid sound, which it is no small thing to the challenge of this work. With this beginning of tetralogy, the next cycle venturing titles more than interesting. As for the voice cast the result has been uneven. The best of the night has been, definitely, the Alberich of Samuel Youn. A very good volume and beautiful tone for a superb interpretation of the miserable and petty dwarf Nibelung. Hopefully still heading in the next installment of the ring. Greer Grimsley has played one Wotan somewhat disappointing. It seemed a small and inconsistent character amidst scenery that naked. her wardrobe, second officer, It did not help much. The character was lacking in presence and voice, with evident vibrato, He was not the entity that the character requires, especially in the higher notes. Sarah Connolly great stage presence gave her Fricka, but I must confess I expected much more of it vocally, It not in vain was one of the most important names of the cast. Wagner may not be the most suitable repertoire qualities. Very good also giants Ain Anger and Alexander Tsymbalyuk, They filled the stage with her voice and presence. Sophie Bevan solvency office with his character Freia, one of the most restless on stage. very well, and so he awarded the public, the Erda of Ronnita Miller. Also excellent three daughters Isabella Rhine Gaudí, María Miró, beautiful soprano voice, and Claudia Huckle, for the occasion were dressed as beggars. Joseph Kaiser has a rather small voice, but enough for fire god Loge. A Wagnerian tenor bell, although not volume. One of the best performances of the night was the Mime of Mikeldi Atxalandabaso. He debuted on the character and excelled, both vocally, and the interpretation. Four years seems too long to see complete this tetralogy Ring. Hopefully worth and next time we can see in one season.